Showing off our Wild Rye long underwear on top of Highland Peak. The snow cat came to an abrupt halt on a small plateau. As we hopped out one by one, our eyes immediately fell upon the airy ridge ahead. Speckled with a line of ant-sized skiers, the ridge rose sharply to a spectacular summit way off in the distance, with nothing but line after steep line of powder-filled runs falling off the side. I nervously strapped my skis on my back, unbuckled my boots a bit, then stepped through the gate. No turning back now. Time to complete the Aspen right of passage. I was in Aspen for a girls weekend of sorts. 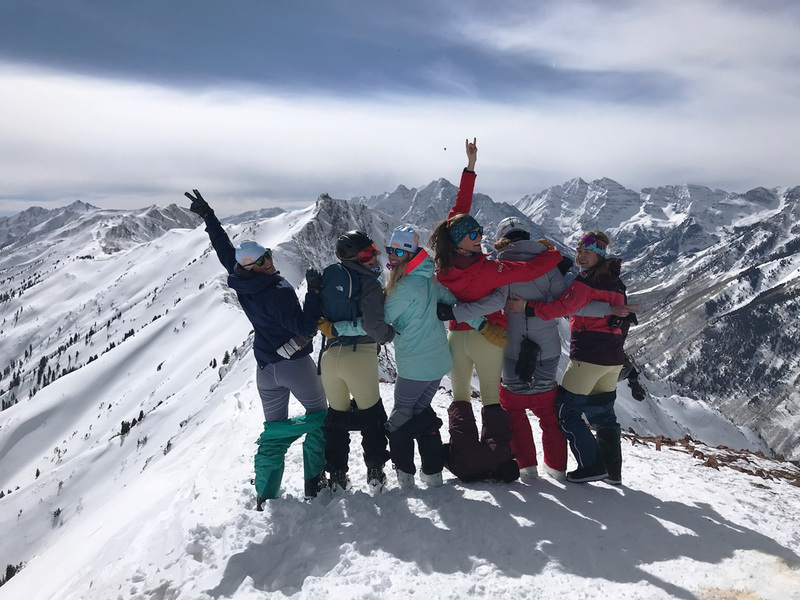 The goal was to ski each of Aspen’s four mountains—Aspen Mountain (Ajax), Aspen Highlands, Buttermilk, and Snowmass—while testing out some great lady boss gear from Wild Rye and Skida. Despite a dry and difficult start to the season, by the time I arrived in late February, almost 100% of the terrain was open, all of which we would enjoy under the quintessential bluebird Colorado sky. We started the long weekend by setting our intentions together with the always fun and empowering Jayne Gottlieb of Aspen Shakti. Part of the exercise included picking one word to focus on over the next few days. Although I showed up in the middle of the session, I was immediately handed a glass of prosecco and asked to choose my word. 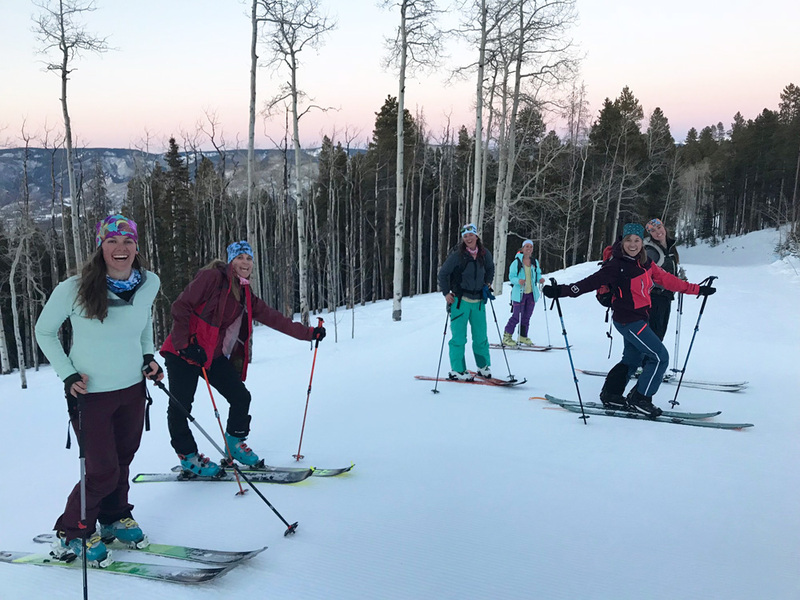 Without even having to think I blurted out ‘community.’ One thing I love about a bunch of hard charging outdoor women getting together, and what keeps me coming back for more, is the sense of community. Instead of competition to show superiority at some skill, it generally turns into a supportive, let’s-empower-everyone-to-be-their-best type of event. Whether or not it’s because I set this specific intention, I would go on to see this theme of community echoed throughout my entire time in Aspen. Our first morning, we headed straight to Aspen Highlands, widely considered the locals mountain with its plethora of secret powder stashes, line-free lifts, and uncrowded runs. Declared a rite of passage for anyone who skis in Aspen, locals and visitors alike, Highland Bowl was our ultimate objective for the day. HIghland Bowl offers the thrill of big-mountain skiing without the inherent risk associated with the unpatrolled backcountry. The whole reason this is possible at all? Community. Every year, an army of locals volunteer to bootpack up and down Highland Bowl in order to compact the layers of early season snow. This helps to create a solid base that is less likely to slide in an avalanche throughout the rest of the season. The incentive, apart from creating a safer environment in which to ride and ski all while getting in shape, is anywhere from a discounted ski pass to a full Premier Pass, depending on how many days you volunteer. The earn-your-turns ethic runs deep in Highland Bowl — the Loge Peak lift only takes you so far. Access to the bowl’s roughly 120 acres of expert-only terrain, with pitches ranging from 38 – 48 degrees, requires a 30-45 minute steep (782-foot vertical rise) hike up along the ridge to the 12,392 summit — the aforementioned snowcat ride shaves off a slight portion of this hike to the first access gate. But that thin-air workout is most definitely worth the rewards. You are treated to not only a 360-degree view of the Elk Mountains, Maroon Bells and Pyramid Peak included, but also the run of your life down the chalky snow-filled face of the bowl. I am far from an expert skier, so to say I was nervous to drop into the 40-degree pitch Ozone run would have been and understatement. But powered by the enthusiasm and support of our little all-female troop, I dropped in. It wasn’t fast. And it sure wasn’t graceful. But I hooped and hollered my way through some fun turns and made it down in one piece. Celebrating our successful ski of Highland Bowl. 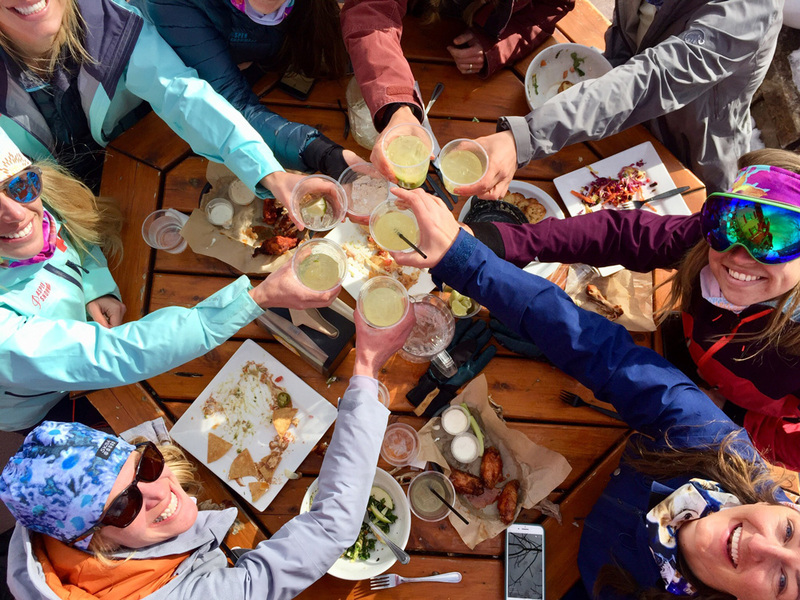 We celebrated the successful completion of our Aspen right of passage first with an on mountain après of margaritas and wings at Highlands Alehouse, followed by the most amazing wine tasting session led by Jill Carnevale, sommelier at Ellina Restaurant + Bar. She brought out her favorite wines, including an often overlooked Riesling that goes well with spicy Asian food and one of my favorites, Barolo. Rising straight up from the center of town, Aspen Mountain, also known as Ajax, is famous for its black diamond terrain filled with bumps, steeps, and trees. The Silver Queen Gondola, accessed right from downtown, climbs over 3,000 feet in just 14 minutes to reach the 11,212-foot summit. We spent the second day doing top to bottom laps off the gondola, including a cheeky long lunch, relaxing on the sun-soaked deck at Bonnie’s mid-mountain. As we rode the lifts and skied past the numerous glades, I was on the lookout for the infamous shrines hidden in the trees that commemorate notable locals and celebrities, such as John Denver and Jerry Garcia. Skin up Buttermilk for the Cliffhouse full moon dinner. As if skiing Aspen Mountain wasn’t enough excitement for the day, we headed over to Buttermilk — home of the Winter X Games — for an après skin up to the Cliffhouse Restaurant. On full moon nights during the winter months, Cliffhouse plays host to those who are willing to get there under their own power, in return offering hot chocolate over a roaring fire outside, with live music, à la carte dinner specials, snacks, and a cash bar inside. There there is no lift or motor-powered access of any kind. Everyone (doesn’t matter who you are) must skin or hike up, then ski, snowboard, or hike back down by the light of the moon. It was a magical evening — a community, young and old alike, coming together to celebrate their shared love of winter and the natural environment in which they live, work, and play. May we all strive for the same sense of community in our own towns and neighborhoods. How to get there: American, Delta, and United offer seasonal service from cities such as San Francisco, Los Angeles, Dallas, and even Chicago direct to Aspen. However, flying into Denver may be cheaper and more reliable, where you can hop on a CME Resort Shuttle that will drive you to your hotel in Aspen — the drive takes around 3 ½ to 4 hours, but it’s a pretty one and there is WiFi onboard the shuttle. Where to stay: We all stayed together in a gorgeous rental house in Snowmass, but you have many options for staying downtown Aspen, including the first-class Limelight Hotel where I stayed last summer. 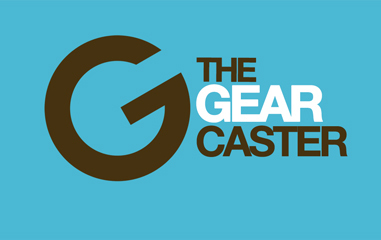 Gear: Most everyone prefers to ski on their own gear, but if you can’t be bothered to lug a huge ski bag with you, especially for a short trip, make your life easier and rent skis or a snowboard from Four Mountain Sports. Not only do they let you test out a new pair of high performance skis each day, but they offer free storage for the night, as well as free transfer of your skis and poles between the four mountains. Season pass: The four resorts of Aspen Snowmass are now on the new Ikon Pass, with seven days of skiing included in the price. Add unlimited Squaw and Mammoth, plus seven days at SkiBig3 in Canada, and the Ikon Pass is looking like a winner for me next year.